It is clear: everyone has a role to play in advancing the Sustainable Development Goals (SDGs) and it is time to accelerate our efforts towards their worldwide realization. During the World Economic Forum in Davos this week, the SDG Media Zone honed in on this very topic, bringing together leaders from across sectors to discuss the goals and the imperative of working in partnership to leave no one behind. 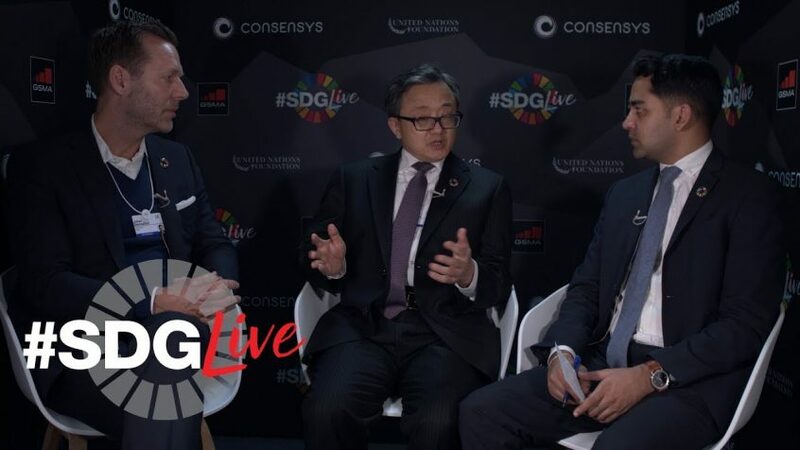 On 23 January, UN DESA’s Under-Secretary-General Liu Zhenmin joined the SDG Live stage together with Telia’s CEO Johan Dennelind to discuss how innovation and technology can advance the goals and how private sector involvement can be a catalyst for change. In the session moderated by UN Foundation’s Pratik Desai, Mr. Liu stressed how technology and innovation benefit both developed and developing countries and how they are crucial for SDGs realization. He also urged the private sector and the scientific community to play their part in assuring the success of the goals. Similarly, Mr. Dennelind stressed the importance of turning awareness of the SDGs into impact, especially in the business and technology sectors. He discussed the work that Telia is doing to promote SDG awareness by incorporating the goals into their business model. For example, they created a Unite program for internal engagement to encourage all Telia employees to be engaged in the SDGs and commit to be active around a specific goal to make a difference. When other businesses take this approach, the importance of the goals is expressed, and awareness will turn into impact that will make a difference. Mr. Liu discussed the importance of bringing innovative technologies to all countries. He stressed that to achieve economic growth, everyone needs to be brought to the next stage of development. The inequality gap needs to be narrowed and the digital divide needs to be resolved. By developing a strategy that ensures that modern technologies will contribute in positive ways, all people will benefit. Mr. Liu also underscored how the technological development of artificial and robotic intelligence, must be created for the mutual benefit of all people. Both Mr. Liu and Mr. Dennelind agreed that in a globalized world, we must ensure that in addition to competition, there must be more cooperation if the SDGs are going to be achieved. They also stressed the power of digital technology on the economy and its benefits to societies. If this idea is understood by all relevant stakeholders, barriers to digitalization can be removed and everyone can enjoy the benefits of the 4th Industrial Revolution. Both Mr. Liu and Mr. Dennelind look towards the future with excitement. They see the interest and readiness of governments and the private sector to accelerate innovation and technological advancement to achieve the goals, and are confident that the challenges the world faces can be alleviated when there is collaboration. With everyone ready to play their part for the SDGs, the future of our world is bright.